Her resume of teams that she has played for reads like a book of Who's Who of Southern Illinois softball. She began her competitive career with Fults in 1966. After 9 years of success with Fults, she moved on to participate with the Class B State Champion and USSSA World Champion Hecker Miller Lite for 10 seasons. That led her to compete with Dashners from 1986 through 1991, where she captured another State Yitle and 9th and 10th World Tournament placements. Following that, she competed with the Co-Ed teams of The Marauders and Miller Lite Misfits before playing with Wells Fargo. She presently participates with two outstanding squads, the Arch Rivals and the 60+ senior team of Sho-Me. Glenda has participated with many great players over the years and mentions Deb Germann, Cinda Liefer, Linda Byron, Sandy Mason, Jeri Mueller and Judy Kaiser as only a few. Surrounding herself with such talent has allowed her to understand the word team, stating, "We win as a team, we lose as a team. It is always a team effort!" 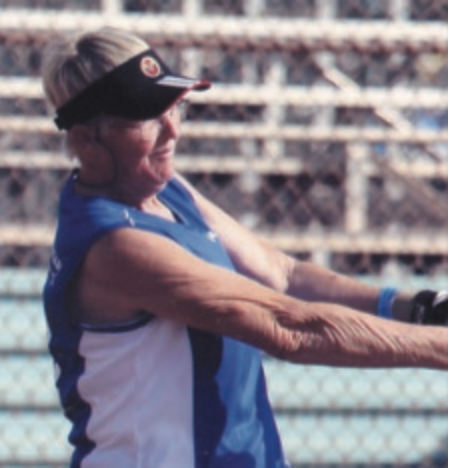 The Illinois USSSA Hall of Fame was created for those like Glenda who, after 50 years of softball participation, still has the burning desire to play the game without regret.